Azalea Trail Run - it's a tradition. 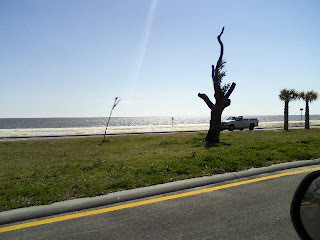 For the past 24 years, I have been in Mobile, AL for the running of the ATR. I ran my first 10k @ the ATR, my senior year of high school, and I haven't missed on since then. 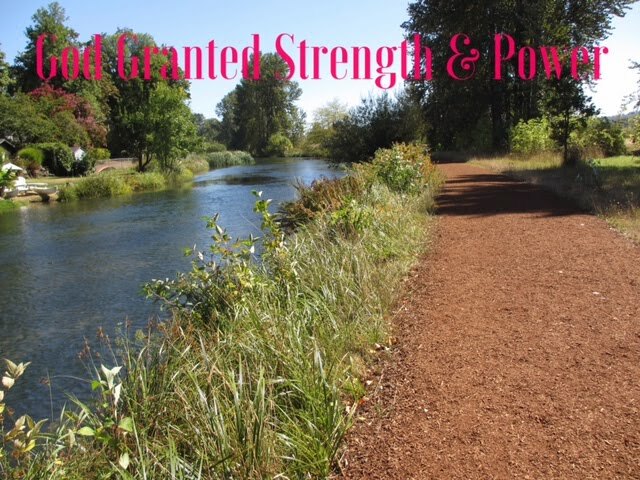 I have run this one in shape, out of shape, walked it, run it, jogged it, and raced it. This year was my best time out of the 24 attempts. You know - if at first you don't succeed..... Sat. was not my 10k pr, but it was my best time at the ATR. Typically, for this race, the weather is on the warm and humid side, but this year it was GREAT. This week was a "step back" week in my training for Boston so this race was timed perfectly. 25 miles for the week. 3 quality runs - Monday will be my last long run before my taper - 20-22 miles. Heading to the race on Sat. I felt like I would run well. In fact, I really thought it may be a PR race for me. I did run well, and I am happy with my time, but I am just a wee bit disappointed in missing the pr. Splits - 7:47, 7:38, 7:41, 7:49, 8:00, 7:56, 1:59 - last 2.2 got me! This year they added a 5k to the ATR which was good, but the only bad part was they had the 10k and 5k races to merge in the later part of the 10k race. So in the last part of the race, the 5k walkers and slow runners merge with the faster 10k runners so it forced you to do some "bobbing and weaving" in the last part of the race - urgh! I HATE bobbing and weaving at the beginning, in the first half mile, but at the end of a 10k - it was too much - legs really don't want to bob and weave. Also, with the bob and weave you end up running extra mileage. I didn't do too bad, my Garmin ended at 6.25, but even that, is time wasted. 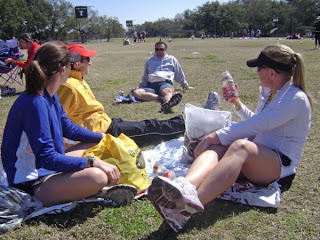 After the race I was able to find a few friends and everyone that I spoke with had issues with the 5k/10K merge. 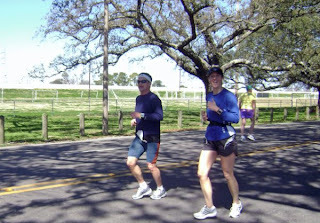 Eric - had a pr race anyway - go Eric, Phillip mentioned he ran 6.3 because of the bob and weave, Karen ran a good race, Robbie had a good race but had to run around strollers, walkers, etc. Kent ran the 5k and had a good race. Missed Terri at the race, but her text indicated she ran well, had fun, but "the merge" - urgh! Boston will be about running well and having some fun. Great week of training and racing. Last week I ended with 42 miles for the week. 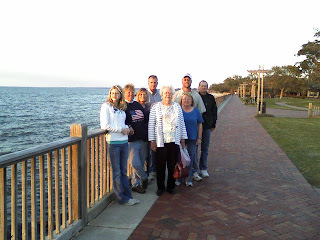 The week ended with a quick weekend trip to Gulf Shores, AL and part of the day on Sat. 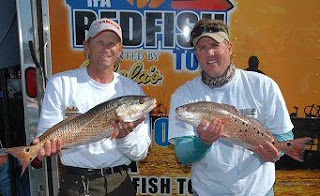 in Destin, FL to see hubby's Redfish Tournament weigh-in. They came in 3rd place. Monday - I started the week off with another Boston training run. 21.5 miles starting at 10:30. This time I had a little larger breakfast and then a snack at 9:30 and then headed out. Chad dropped me off @ the Longleaf trace @ Jackson Rd and I ran home. So the first 7 miles were flat and then the rest of the mileage was on hills. I averaged 9:22 pace. This time I also tried a different gel. Because of the hunger issues that I have mentioned previously, and the later Boston start, I decided to try the Accel Gel with carbs and protein. I used my regular Gu chocolate for the first 2 gels and then I used the Accel Gel for the last 2 gels. It worked great, no hunger at all and I seemed to tolerate the new gel with no issues. I will try the Accel gels a couple more times to make sure they work ok for me. Tues. - am yoga class, and 3 mile easy recovery run pm - 10:37 avg. pace. 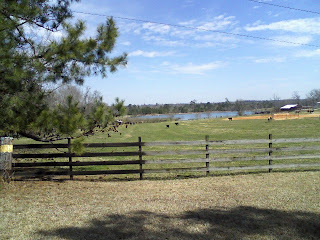 Wed. - met Kelly to run some rolling hills in Canebrake - 9:49 pace. Fri - Race day - woo hoo - an evening run - The St. Thomas 5k 5:30 pm start - beautiful weather - around 70 degrees and low humidity at race time. So we are off. Didn't really know what to expect from the day. At this point in the week, I had already run 33 miles with a 21.5 mile run on Monday, but I was excited to be racing a 5k. I quickly started running behind a lady who was running at a good pace. I felt good early on, several early peeks at the Garmin indicated that I am moving too fast, but I feel good and I want to stay behind this lady who is doing an excellent job of pacing. She also seemed to be really strong and I felt certain she was not going to fade in the end. Hoping I can hang with her. This race is an out and back on the trail. At the turn around, I am shocked because I am still with the "lady pacer" and I still feel ok. At 2 miles it is getting really tough & I fade just a tiny bit, but toward the end I seem to close the gap a little. I am excited that I held on to the end. 23:22 - 7:38 pace. Splits - 7:30, 7:41, 7:43, :26 This 5k time is only 16 seconds slower than my pr of 23:06. Totally stoked! I haven't even been doing any speed work. Also had a chance to visit a tiny bit with some friends which is always nice. Not sure what I won maybe age group, maybe master's - I was talking - oops - but I do know that I won a huge jar of peanut M&M's - I know this because I have been munching on them all weekend - not recommend for Boston training. As I am driving home, out of no where, it hits me like a storm - "PR FEVER." 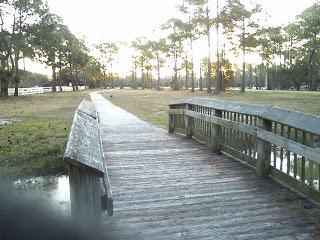 You may remember that I had this illness in Nov., just before the Stennis half marathon - running well - excited about a chance to PR - the whole debate of whether to "go for it" or not. I did go for it, and I did it, but just after that I was injured with the whole hip thing. So it hits me again. 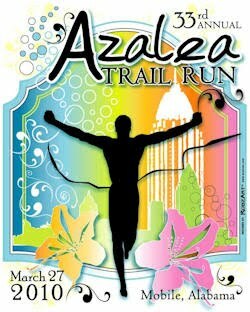 I have the Azalea Trail Run 10K coming up next weekend in Mobile, AL. Not sure about a pr at this one... it could happen if we continue to have cool weather, but now i really want to find a 5k to go for a pr in the 5k before the Boston marathon "does me in" for the spring. 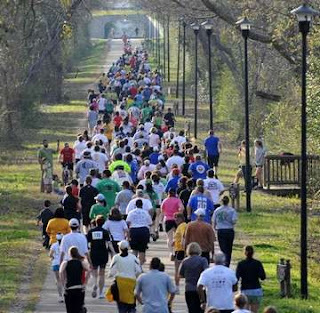 I think I will give it a try at The Run for the Roses 5k, Prentiss, MS April 10th. Trust me, when the fever hits like this, all you can do is just go with it. Gotta give it a try....my pr days are limited. Sun - so today - I TOTALLY DID NOT WANT to run. The wind woke me up several times during the night, and continued today. It's chilly and windy and I didn't want to do it, but my desire to get my 48 miles for the week won out. I headed out into 24 mph winds with gusts to 36 mph to get my final 6 miles for the week. During the run, I take a peak at my Garmin at 2.28 miles and this is when I noticed that I was happy to be out the door and running, even with the wind howling. When I finished the run, and laid down on the floor I had the sensation after you have when you have been on a boat all day. The wind had blown me so much on my run that I had a swaying feeling while on the floor - weird feeling for sure. So this has been a great week of training and racing - 48 miles running, 4 miles walking, 1 yoga class. This week I will step back in mileage and will race the ATR 10K next weekend. The 10k will be my tempo run for the week. This will be my 24th year to run this race. Hard to believe it, but it's true. So many things to blog about today. Today I had an 8 mile run, which will be followed by 8 mile runs on Thurs. Fri. and Sat. I may mix it up and run 2 x's some of those days. In fact, on Fri. I have hill repeats so I may run 5 miles in the morning - running the repeats, and then an easy 3 mile run in the evening. But for now, back to today's run. It wasn't easy. I averaged 9:53 pace, which is ok for my recovery run, but it wasn't easy for sure. I started out my run carrying my water. I didn't want to drive out and drop waters, and I didn't want to wear the fuel belt, so the plan was to carry the water to the 2 mile, drink and drop the water and drink again when I came back, with 2 miles remaining. So I drop the water, continue running, and about 1/2 mile down the road the prisoners are sitting on the side of the road eating lunch. This is the "clean up the road prisoner crew." As I pass, I spoke to the Sheriff and continued on with my run. Today, is the first warm and humid day of running that I have had this year (67 degrees & 78% humidity, not awful, but need my water). As I make my way back, I am looking forward to my water stop, but guess what? Yep, the prisoners are gone and so is my water. I suppose they finished their lunch, and started picking up the trash again, and they covered the area where I had dropped my water. Bummer! I start running again and soon forget about wanting water. I am heading up hill for 1.5 miles and I have a strong headwind. My legs feel tired. At this point, I realize my legs are sore. Yes, I ran a hard 10 miler on Monday, but it's not that, it's something different. What is it? I am shamed to say - it's the pine cones. On Tues., my exercise for the day consisted of picking up pine cones in the yard for 40 minutes. This is not my first time to have pine cone fatigued legs. It's embarrassing each time it happens, but I can not tell a lie, my legs are sore from bending over and picking up pine cones. It always amazes me that I can run, run, run, but picking up pine cones is brutal. Pics from my recent runs. Fri tempo run - 1 mile w/u, 5 miles @ 8:23, 1 mile c/d. A little slow, but I jumped from 3.5 mile tempo to a 5 mile tempo, so it's good. Will work on getting the 5 mile tempo time down. Happy to be back up to 5 mile tempos. Sat. 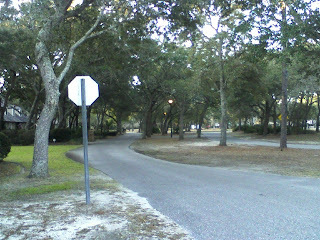 run - Gulf Shores, AL - run on the Ft. Morgan bike path. 4 miles - last mile I ran 7 X 12 seconds fast. In honor of my 42nd year, this week, I will run 42 miles. No time and too tired to blog. Just a quick hello to say, I'm still around. I'm still working on the project. I'm still training for Boston. Life is good, training is good, but I am tired. LOL! Had a fabulous overnight trip to New Orleans with Dawn and some other friends. 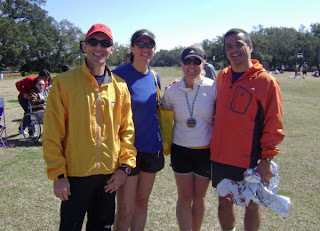 I went to New Orleans to get in a training run and run the part of the Mardi Gras Marathon course, with some friends. I ran most of the time with Charles, but did get to run a little with Dawn. Charles was running his first marathon. It was fun to run with someone new to the challenge of the distance. It was a beautiful day in New Orleans, sunny, and cool weather. After the race we enjoyed the sun in City Park for a while. Charles finished his first marathon and Dawn finished her 9th. 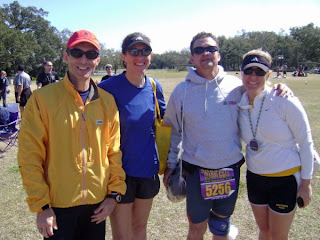 We had many other Pinebelt Pacers in New Orleans running the full or the half. James and Neil BQ'ed on their first marathons. Several pacers had half marathons pr's. Woo Hoo! Good day of racing and training for me. Fun to be around all of the excitment of racing. Before getting too stiff, we decided to go back to the hotel to check out, and then went get some lunch in "the Quarter" with Charles, Terry, and Dawn (in the pic above). Shrimp Etouffee - yummy. Terry treated us to lunch. How sweet was that? Thanks Terry! After a late lunch, Dawn and I made the drive back to Hattiesburg. I ended up with a little over 19 miles and 35 miles for the week. Hip is still feeling good so I may try to add a few hill repeats this week. Today, I am sore from the 19 miles, mostly because I didn't take the time to get in an ice bath last night. Once again, I am reminded how much the dreaded ice baths help me to recover fast. The shop remodel projects is coming along. We are finally finished with the tear-up and construction part. Now we have to do all of the finishing work - caulk - lots, and lots, and lots of caulking to do. Then some sanding and painting under the carport and front porch. Chad will be out of town for the next 2 weeks. I am going to slow the pace on the project and try to focus a little more on my training and definitely focus more on my eating or really focus on not eating so much. Need to drop a few lbs. in the final 7 weeks before Boston. In the past, I thought it was impossible to drop pounds while training for a marathon, but I have done it 2 times, and I am hoping to do it again this time. Need to get back down to "race weight" and get out of my construction weight - stress induced eating weight.